A two vehicle accident sent a tow truck into a power line pole Tuesday afternoon in Knoxville. At approximately 4:40pm, a silver minivan traveling west on E Robinson St struck a tow truck traveling south on S Attica Rd. 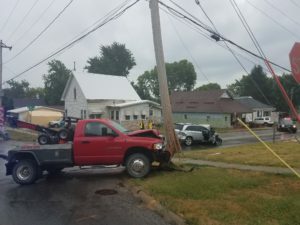 The collision damaged a utility pole. Mid-American Energy was called on scene to survey and make repairs, with no power outages reported. Both drivers avoided injury in the crash, and the cause is unknown. The Knoxville Police Department, Knoxville Fire Department, and Marion County Sheriff’s Office responded to the scene.